Knife maker Gil Hibben and his son, Wesley Hibben, teamed up to bring to life this insanely stylighHibben Legacy II Fighter knife. This fixed-blade design features a fantasy-style 8" blade crafted of 7Cr17MoV stainless steel with a sharp edge culminating in a wicked point. The oversized guard and pommel, complete with a lanyard hole, are a handsome transition to the smooth pakkawood handle. Red Micarta spacers give the Legacy II fighter fixed blade a touch of flash and elegance usually reserved for custom, one-of-a-kind pieces. The Legacy II Fighter includes a custom embossed leather sheath. It measures 13-3/8" in overall length with an 8" blade. This knife is a real eye-catcher. I was attracted by the unusual blade shape, but avoided purchase initially in favor of more traditional blades. Got it now, and the blade is really something, the point is sharp as can be, you gotta be CAREFUL, don't be flippin' this thing around. Blade came sharp. The Titanium finish is excellent, low key but attractive, and matches the finish of the finger guards and pommel. Handsome handle, feels great. Understated, finish doesn't seem to show fingerprints. Sheath is thick, and custom shaped, snap retainer was spot on. Great collector knife, looks like a reverse scimitar blade, uh ... camping? Probably never. 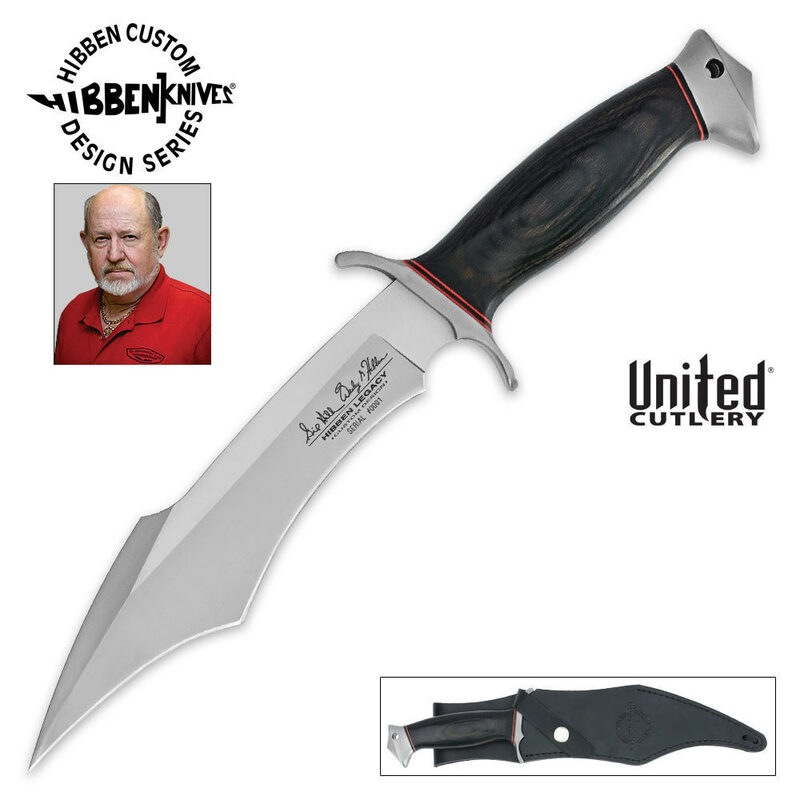 I have other Hibben pieces, and I gotta say, I really like this one. The sheath is decent leather. good and stiff. the dye is a little iffy but the build itself is good. the grind and the finish of the blade is amazing for a production knife. mine came razor sharp, I would assume they all do. handle is nice and fat with a good heft in the hand. it is slightly back balanced for a quick, reactive, lively feel in the hand. Well made knife. Because of its shape, am not sure what you would use this for. Liked it enough that I bought another after they lowered the price.